The major attractions in Yellowstone National Park are the numerous thermal features that can be found throughout the park. There are many other attractions that are well worth seeing in other parts of this very large park (almost 3,500 square miles). One such attraction is the Grand Canyon of the Yellowstone. Located on the eastern side of the park, this Grand Canyon is much smaller than its namesake located in Arizona, but it is still quite impressive, measuring 23 miles in length and featuring two magnificent waterfalls. 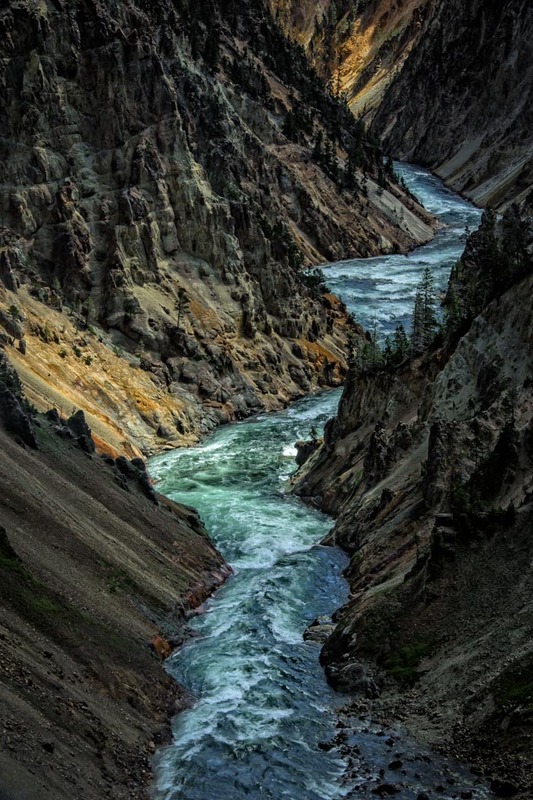 The canyon was formed over thousands of years by the ceaseless erosion of the Yellowstone River. There are classic views from viewpoints along the north and south rims that are easily accessible from parking lots and result in a great view of the lower falls. I wanted to get a different view and composition of the area and decided to take the 1/4-mile trail from the overlook. While it is a very short trail, it drops 600 feet from top to bottom. It is an easy walk down but not as easy going up, especially being about 7,000 feet above sea level. The trail ends at the top of the lower falls and this is the view of the Yellowstone River looking toward the upper falls (they can't be seen from this spot due to a bend in the river). The lighting along the river is a bit spotty as the canyon walls blocked a lot of the sun. Pretty impressive example of erosion.